Water Walk for Life Along Pilgrim Pipeline in Northern New Jersey – Engage! Story by Rev. Janet Kroboth-Weber, Rockland Coordinator of Water Walk for Life, edited by Shaun Bartone, Editor, Engage! The Water Water Walk for Life initiated by the Grafton Peace Pagoda, in Grafton, NY, under the direction of Jun-San Yesuda, Buddhist nun of the Nipponzan Miyohoji order. Activists on a 90-mile walk in protest of a pipeline that they fear would jeopardize North Jersey water supplies stopped in Mahwah on Tuesday to link with local Native American tribes in opposition to the project. Led by a Buddhist nun, Jun-San Yasuda, the “Water Walk for Life,” as the protest is known, is traversing roadways along the projected route of the Pilgrim Pipeline, a proposed 178-mile dual pipeline system that would run from Albany to Linden, transporting an estimated 16.8 million gallons of crude oil daily. Preliminary maps show the pipeline crossing the Highlands Region and entering Mahwah, where activists fear that a potential oil spill could compromise drinking water for millions in the state. More than 30 walkers beat drums and waved signs that read “Water is Life” as they entered Halifax Road on Day Four of their eight-day trek from Carteret to Peekskill, N.Y. This prayer walk of sacred activism is to raise awareness about water and pipeline issues. It is an eight day, 90 mile walk that begins on March 4 with a water ceremony by First Nations representatives at the waterfront in Carteret, New Jersey. Each night there is a public-invited potluck with speakers on local issues, where the walkers will stay each nite at a different church. On Day 4 the walkers arrive at Ramapough-Lunaape Nation’s ceremonial grounds for a tobacco ceremony. This is where they have established a prayer camp in solidarity with Standing Rock and in resistance to local pipelines. The walk makes its way northward through New Jersey and then cuts eastward across Rockland County, NY. Then after staying one night at Fellowship of Reconciliation national headquarters, the walk again swings northward, with a prayer stop on the Hudson river opposite Indian point nuclear plant. The walkers take a break next day and head to Washington, DC March 10 to join the Million Native Americans march on Washington, DC. The final day, March 11, the walkers head to Westchester, New York, where there will be a prayer vigil at the Indian point nuclear plant. A delegation from Japan will be on the walk and this vigil will acknowledge the sixth anniversary of the Fukushima disaster. The walk closes at the nearby waterfront with the closing water ceremony by First Nations. The closing prayer and potluck/ speakers will be at a nearby church in Peekskill, New York. The Water Walk for Life has a Facebook page by the same name– a pinned post at the top has the complete schedule. Also posted on the Facebook page is a copy of the front page of the flyer that has the Buddhist prayer calligraphy and medicine wheel, with more of a description of the pipeline issues and what the tribe is facing. The pipeline project for this area would carry the same crude oil as in North Dakota. So the Ramapough tribe’s sacred sites and watershed are also at risk. 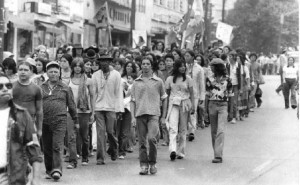 In 1978, Native Americans organized “The Longest Walk”, wherein participants walked cross-country from San Francisco, California to Washington, DC. 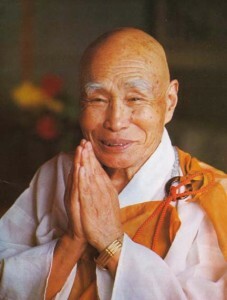 Accompanying them on their walk, was a Japanese Buddhist Nun from the Nipponzan Myohoji order. Since then, Jun Yasuda has crossed the country four more times on foot and logged in several thousand additional miles for the cause of peace. 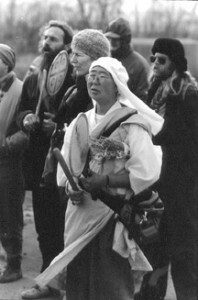 She walks beating her drum while chanting a prayer for peace Na-Mu-Myo-Ho-Ren-Ge-Kyo. Many times, she has spent days fasting on the steps of the NY State Capitol in Albany for support of freedom for a Native American activist Dennis Banks. In 1983, during one of her fasts, she was approached by Hank Hazelton, a long time activist for Native Americans. Hank had heard of her work and offered her a parcel of land in Grafton, New York, for the purpose of building a “Monument for Peace”. In 1931, Nichidatsu Fujii, teacher of the Nipponzan Myohoji order, met Mahatma Gandhi in India. They became friends, and together joined in sending out prayers for peace and non-violence throughout the world even as the clouds of World War II began to grow on the horizon.